Andrew Olah, the founder of Kingpins Show & Transformers and the CEO of Olah Inc., discloses what the next edition of Kingpins Amsterdam, taking place on October 25-26, 2017, and Kingpins Transformers, happening on October 24, both in Amsterdam, will present to international denim and jeans insiders. What will visitors discover at the upcoming edition of Kingpins Amsterdam? We are preparing what we believe to be an exciting event with multiple and significant seminars. Among them there will be Lycra’s Jean Hegedus speaking about “Solving Denim Dilemmas: Right Product, Right Story.” Vintage denim collector Eric Schrader will talk about learning denim's history and future. Superstories’ Peter van Rhoon will explain how creativity and ROI can help accelerate business. Our Kingpins Trend installation and forecast is back with a focus on the s/s 2019 season. We have again worked with Amy Leverton of Denim Dudes to develop the best denim trend information in the market. An art and indigo exhibition by Calik will celebrate its 30th anniversary. And finally our Kingpins Transformers conference held on October 24, one day before Kingpins’ kickoff, is about women in the Denim Universe (more details here). So, altogether we believe our event will be full of intellectual and important nuggets of information. Will the show host new sections or initiatives? There are no more pavilions in Westergasfabriek–our venues–to use. So we will use all that is available to us, which includes our tents, Transformatorhuis and our known Gashoulder building. We do have a number of new and updated installations and initiatives for our attendees to enjoy and benefit from, including some great new work by Tonello, Adriano Goldschmied, Jean School, Calik and more. The show will host 82 exhibitors and two sponsors in the same areas we hosted in the past without any layout change or additional new areas. Global Denim Awards will not take place for this edition. Why? The Global Denim Awards has been placed on pause until we find a new sponsor. Can you already give us some hints about eventual new projects your group will focus on for the next months? How would you describe the present denim and jeans market situation? And how will it develop? 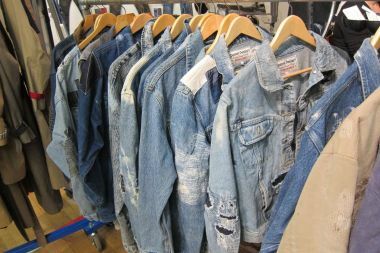 The denim market is good–amazing for some aspects–and horrendous for others. The industry is going through massive shifts. Not everyone is prepared. What used to be will never return. We are now entering new territory and the terrain is unlike anything ever seen before. Just as the music and publishing businesses have changed, fashion is now undergoing the same transformation. The changes in our industry are on various fronts which we all realize each day. More and more business is done via the Internet and the major retailers are aggressively taking more and more market share which in the end negatively affects small retailers and large brands. But, as always, someone’s darkness is another one’s light and so opportunity has arisen for those that can see it. “Denim Trends for s/s 2019: Fit, fabric, finish” presented by Amy Leverton of Denim Dudes. Jean Hegedus, global denim director for the Lycra brand, will illustrate approaches to using consumer feedback for both successful product development and engaging storytelling in the denim space. Eric Schrader, star of the film Blue Gold and owner of Junkyard Jeans in Boise, Idaho (USA), will talk about learning denim's history–and future–from studying thousands of pairs of vintage jeans. Schrader will focus on construction, design and what the industry can learn from fakes. Peter van Rhoon, founder and creative director, Superstories, will present a number of cases of B2B storytelling and give insights into how to measure the ROI of storytelling efforts. He'll discuss how PR and social media work together.